I was invited by the Dominican Republic to explore the country’s north coast. In recent years, the all-inclusive beaches of Punta Cana have grown in popularity. But Puerto Plata and the north coast wants to make a name for itself as a low-key alternative to the southeastern resort beaches. It has an incredible beach, but it’s also a good central point from which to explore local adventure and cultural activities. While it’s true that I’m from Los Angeles, and have for many years perpetuated the rumor that we Southern Californians surf to school, I’ve never actually attempted surfing. I’m not great at learning these sorts of things (see my failed snowboarding attempt). In the water at Cabarete, just down-coast from Puerto Plata, I couldn’t stand up on the board — every time the instructor pushed me to follow a wave, I could get up on my knees, but couldn’t make the fluid motion to stand up. 321 Takeoff has a three-day course where I think I could actually learn to surf by the end of it. After my first hour out, I understood the mechanics of how to do it. The next two days apparently clarify and expand on that, and by the end they say I’d be an expert. And by expert I think they just mean feel confident enough to stand on a surf board. We stayed at the Millennium Resort & Spa. I spent the afternoon drinking beers and swimming in the Atlantic waters of Cabarete beach. I thought about the appeal of having nobody on this beach. I considered the pros and cons of spending future hypothetical millions on private islands to just have the beach to yourself. I sat on the beach taking pictures before deciding there were far too many beautiful things to take pictures of, and this true tropical beauty would lose something once it hit the cold sterility of the internet. Saved images of places that you’ve been can only ever be reference points for you to refresh that memory. One morning we traveled to a shack in the hills, where we changed into wetsuits, lifevests, and helmets and drove up the dirt road to a trailhead. We were spending the day with tour operator Iguana Mama, who took us canyoning along the Damajagua River. 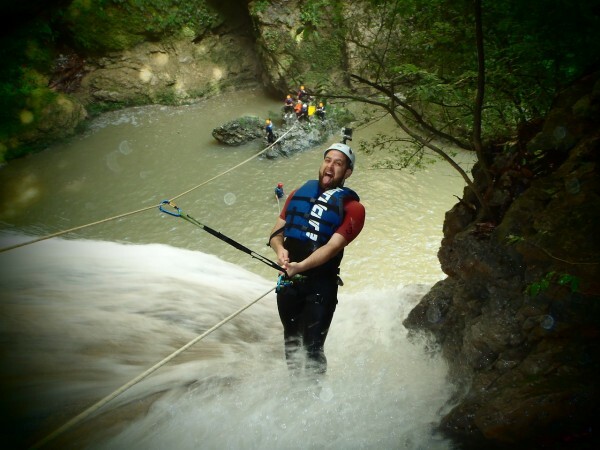 Canyoning is basically hiking in a river deep enough that you have to float, with moments when you have to decide if you’d rather rappel down the waterfall or jump. I filmed myself tying my shoes underwater, which everybody said was a really dumb idea, but I envisioned “shoes tied underwater” as the internet’s next big thing. I guess I was just having so much fun goofing with my new friends as we traveled down the river. The experience is very active, so it might not be for everyone, but I think it was the highlight of my trip. Until I smashed my face on the water jumping off a 45-foot cliff. That actually wasn’t so bad. I just need to work on my form. (Pencil! Pencil! Pencil!) Still totally worth it. We drove away from the beach, past pastures where cattle chewed their cud beneath palm trees and where old women sold roasted chicken in front of their wooden cottages. We drove through verdant country hillsides following a rainbow towards the baseball game. Passing sugarcane fields, our guide suggested that his country’s baseball tradition comes from kids using the sugarcane stalks as bats, and weaving the fibers into baseball gloves. Players who’d excelled having to use crude equipment would then play much better once they were using wooden bats and leather gloves. We went to watch the local Gigantes del Cibao lose to Águilas Cibaeñas. It should be noted that these Gigantes play in a place called San Francisco de Macorís, which technically means they are the San Francisco Giants. 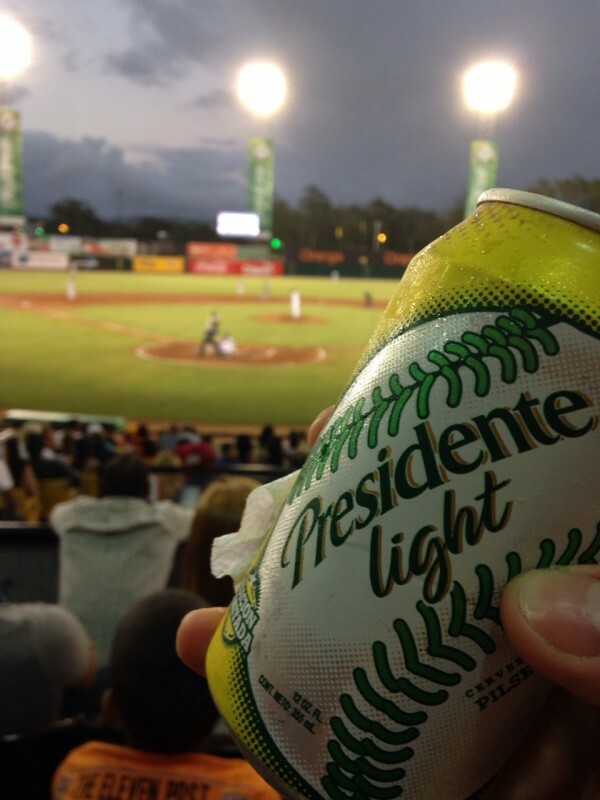 We drank Presidente lights, ate empanadas, and watched a solid ballgame. Several players in the Dominican Winter League also play for the majors. I walked away from the tourist settlements of Cabarete, into the neighborhood where the locals lived. This was the side of town that tourists on the beach never see, but which provides the labor for the resorts. At the Esso I walked passed a horde of teenage drivers filling up their motorbikes. Everyone on this coast has a motorcycle and is trying to convince you to take a ride with them. I saw families of four on motorcycles, people transporting propane tanks, and one live pig strapped between two men as they rode down the highway. I walked through the village and saw old men speaking Haitian creole and playing dominoes. I thought about how this side of Hispaniola was relatively unaffected by a devastating earthquake that destroyed much of Haiti. I guess when you have more resources you can invest in infrastructure. I noticed a peluquería. 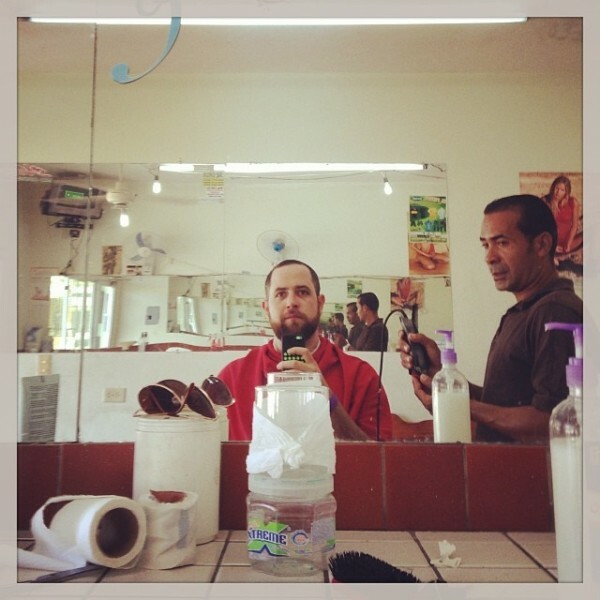 When I’m traveling and sort of bored, and in need of lining up my fade, I enjoy getting local haircuts. I’ve gotten a reggaeton haircut in Echo Park, a drunk trim at a music festival in Romania, and a straight-forward crop from a Palestinian immigrant in Berlin. I like haircuts. Even though I am proficient in Spanish, I had absolutely no idea what the barber was saying as he was sipping white wine and yelling at his girlfriend. As he had the razor to my throat, I wondered how many white wines he’d had this morning. He didn’t ask what kind of cut I wanted, but what he did looked good. 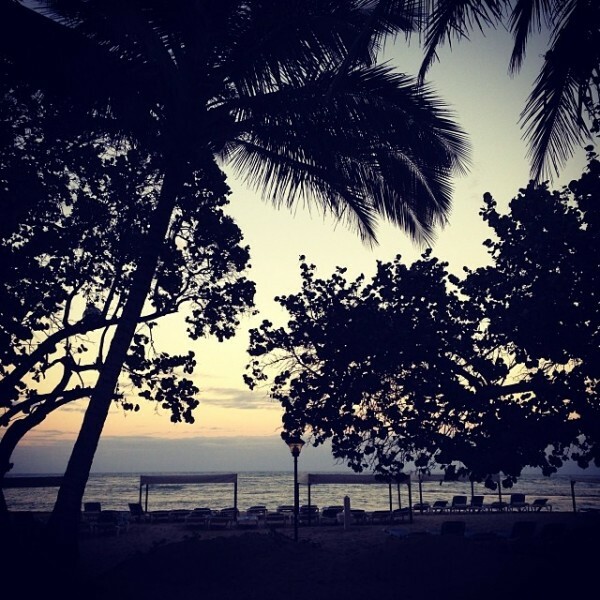 We spent our last nights at Blue Jack Tar, which was the site of the Dominican Republic’s first all-inclusive resort. Today it’s a smaller a la carte hotel that focuses on quality. They’ve started building condos on the property, which are being marketed towards Dominican city-dwellers who want weekend beach homes. We ate a very delicious tasting meal and drank excellent cocktails at the hotel’s restaurant, Green Jack Tar. The next morning I played golf with the other bros I’d made on this #MancationDR. While I was on the golf team in high school (for a PE credit), I’m not really that good (as you could probably tell from my previous resume of in-athleticism), but sometimes I can hit the ball okay. Over the course of the nine holes I realized that my golf game is sort of a metaphor for my life: inconsistent & lacks follow-through. Which is a funny epigram for Twitter, but it’s also one of the real challenges in my life. That afternoon we tasted dozens of rum samples at the Brugal factory. 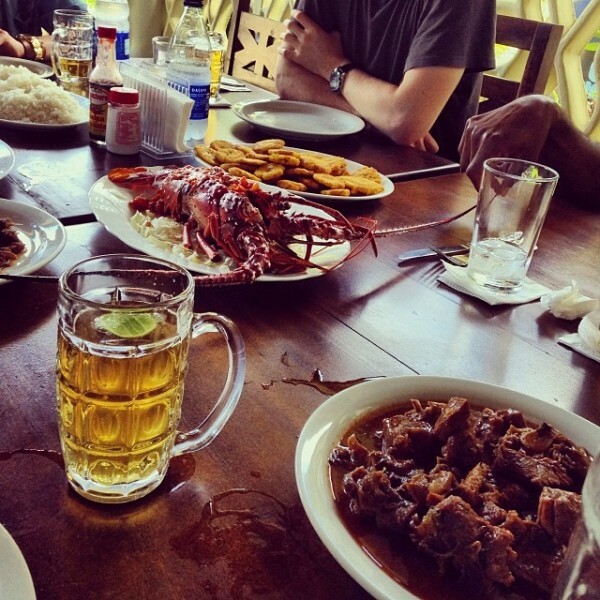 By the time we got to El Manguito on the outskirts of Puerto Plata, we were wasted and in serious need of the biggest, most delicious lunch we’d ever had. We were served a platter of lobster, beans, rice, goat stew, plantains, crab meat, steak, and probably a lot of other things. As I lay in my hotel room napping off the rum and gluttony, I thought about how I would recommend Puerto Plata and the north coast of the Dominican Republic to anyone currently sitting in the polar North America. The flights here are cheap, the accommodations affordable, the variety of things to do is wide, and you get to interact with the local people. Josh was a guest of the Dominican Republic Ministry of Tourism on this trip.